The two major governing factions for the Palestinian territories -- Hamas, which governs the Gaza Strip, and Fatah, which governs the Palestinian Authority (PA) in the West Bank -- are meeting in Cairo, the capital city of Egypt, in order to try to find a way to form a unity government. The meeting comes at the invitation of Egypt's president Abdel-Fattah al-Sisi. In 2005, Israel withdrew all Jewish settlements from the Gaza Strip, in order to promote peace with the Palestinians, and as a step in the so-called "peace process" between Israel and the Palestinians. The intention was that Fatah would govern both Gaza and the West Bank, and negotiations for permanent peace with Israel would proceed. However, in 2006 the rival faction Hamas scored a landslide victory in parliamentary elections in the Gaza Strip, completely shutting out Fatah. Fatah tried to regain control of Gaza through military means in 2007, but was quickly defeated by Hamas. in a stunning surprise victory that shocked the entire Mideast. Since then, there have been numerous attempts at a "unity government" between Fatah and Hamas, and all have failed spectacularly. And so, at the invitation of Egypt, why not give it another shot? It's easy to believe that the Palestinians are homogeneous, all with the same world view and behaviors. That may have been true decades ago, but it's certainly not true today. The Palestinians in Gaza and the West Bank have been physically separated from one another for several generations, and the two regions have grown into two completely distinct cultures. There are even important demographic differences, according to the CIA World Fact Book: The average age in the West Bank is 20.8, and in Gaza it's 16.9. The average population growth rates are 2.3% and 1.8%, respectively. By way of contrast, the average age in the United States is 37.9, and the growth rate is 0.8%. So if the average age in Gaza is 16.9, then Gaza is essentially a society of teenage children. Furthermore, the unemployment rate in Gaza is 43%, one of the highest in the world. So now tell this society of children with little education and no hope of a job that they're going to be governed by the 82-year-old PA president Mahmoud Abbas, and from that fact alone you can see what a fantasy the entire Palestinian unity and reconciliation process is. "Ongoing Egyptian moves to help our Palestinian brothers start a new stage of unity in the Palestinian ranks is preparation for a just peace between Palestinian and Israeli sides, and the establishment of an independent Palestinian state to meet legitimate aspirations of the Palestinian people for a secure, stable and prosperous life." However, the two Palestinian factions decided to not even discuss the question of peace with Israel, but to appoint a new commission to study the matter. The first detailed Generational Dynamics analysis that I wrote was in May 2003, after President George Bush offered his "Mideast Roadmap to Peace," which was to bring peace to the Mideast. The analysis, "Mideast Roadmap - Will it bring peace? ", said that a Mideast peace was impossible, because the Jews and the Arabs would be re-fighting the 1948 war that following the partitioning of Palestine by the United Nations, and the creation of the state of Israel. I wrote that a new war was being prevented by Ariel Sharon and Yasser Arafat, traumatized survivors of the 1948 war who would do anything to keep it from happening again. I wrote that when these two men died, and younger people were in charge, it was likely that war would begin again. At the death of Yasser Arafat in November, 2004, the amount of international rejoicing was enormous. Everyone in the West believed that it was Arafat who had prevented the Israeli-Palestinian peace process from going forward. Actually, as I explained repeatedly, it was not Arafat preventing peace. It was the younger generations of Palestinians who were preventing peace. If Arafat had any role at all, it was to hold back the tide of a major new war. "The leadership of Hamas leadership is not able to control its operatives, and will thus lead to an Israeli response against Hamas activists. This situation is dangerous because the continued provocative attempts to blind soldiers carried out by the terrorist operatives, even if not guided by their commanders, is likely to lead to escalation at this sensitive time of developments in the Palestinian arena; therefore, be warned. The continuation of this phenomenon will lead to an IDF response." This perfectly illustrates why there will be a major war between Palestinians and Jews long before there's any peace. Even if Hamas leadership and Hamas commanders wanted peace, the Gaza population, consisting mostly of children with an average age of 16.9, do not. This kind of thing is at the heart of any Generational Dynamics analysis. "We expect anyone talking about a peace process to recognize Israel and, of course, recognize a Jewish state, and we won�t accept faux reconciliations in which the Palestinian side reconciles at the expense of our existence. We have a very straightforward attitude toward anyone who wants to effect such a reconciliation: Recognize the State of Israel, dismantle Hamas�s military wing, sever the relationship with Iran, which calls for our destruction. Hamas's military wing, Izzadin Kassam, may be a deal breaker in the Palestinian unity talks. Mahmoud Abbas has said that he would not accept a scenario in which Hamas�s armed wing, Izzadin Kassam, kept control of its weapons. "The resistance's weapons are legal. 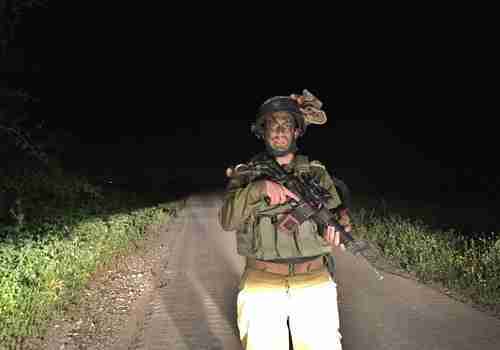 They are here to protect Palestinians and free their lands [from Israeli occupation]."